"Natural fiber blanket is like having a valve to hold water"
If you stopped eating food today, you would live for 28 days, but if you stop drinking water, you will be dead in 3-4 days. The impact of hydration is even more extreme for plants. 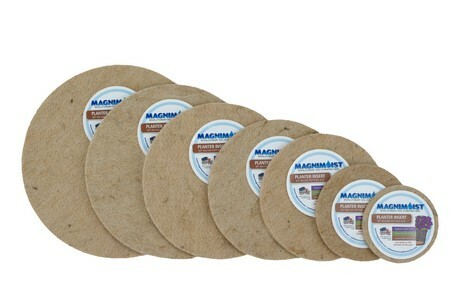 Farmer You LLC offers a natural fiber blanket called MagniMoist that placed below soil keeps the soil perfectly hydrated, saving water, decreasing plant mortality and creates healthier more colorful plants and landscapes. The secret to MagniMoist is a natural plant fiber, kenaf, that has no polarity and is hydrophobic when dry but flips its behavior when saturated. When the fabric is used below soil it is like having a valve to hold water. When the soil is dry the valve is closed and when soil becomes saturated the valve opens releasing the excess water. MagniMoist can be used in the bottom of any plastic container, as wire basket liner (replacing coco), below the soil in landscapes and as a media for growing microgreens. 2019-02-07 "Year-round stable supply of substrate is becoming increasingly important"
2019-02-05 "Everything that happens underground influences what grows above"
2018-11-22 "Natural fiber blanket is like having a valve to hold water"
2018-10-10 "Producing more with less water and nutrients"
2018-10-08 "Seaweed could be key to lower nutrient and water use in horticulture"
2018-09-27 "Wood fiber blends offer increased sustainability"
2018-09-24 "Many suppliers can bring you coco, only a few can bring you a product consistent and uniform"
2018-08-08 How did oxygenation of irrigation water affect bedding plants?